Matt with some of Jeri Ellsworth's pins in Voodoo Too, Portland. Team PBDG member Matt Walsh is in Portland, OR, and he was able to visit that shrine to pinball and donuts: Voodoo Doughnuts Too. The games you see belong to Jeri Ellsworth. If you live in or travel to Portland, you can easily find these pins and more using the Portland Pinball Map. In the San Francisco Bay Area, we are lucky to have an excellent map maintained by PBDG friend Jon O. Tracking 208 locations and 450 machines, it’s a thing of beauty. I’ve used it to find audition locations (really! ), photo shoot locations, and just to have fun. Get out and play! Report more locations! 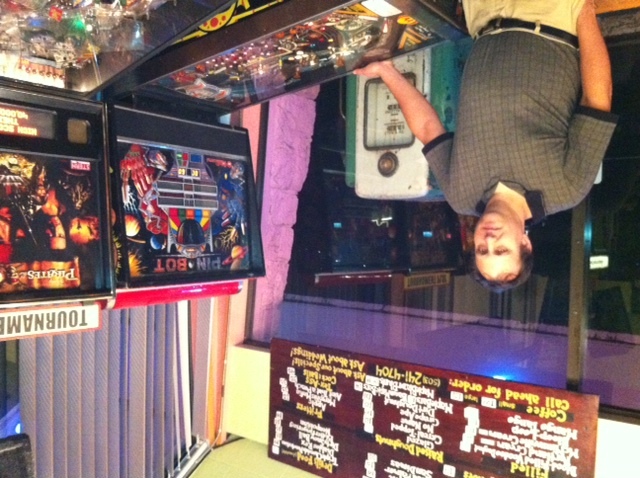 There are pinball maps for many major metropolitan areas; check them out and go play in a new location today. Support businesses that have pins. I bet one is closer than you think. Get really inspired and start a map for your area if there isn’t one. This entry was posted in Crew, News, Pinball People, Vintage Pinball and tagged donuts, film, pinball, portland, voodoo donuts by Anna Newman. Bookmark the permalink. Pinball Donut Girl is a sponsored project of Fractured Atlas, a non-profit arts service organization. Contributions for the purposes of Pinball Donut Girl must be made payable to Fractured Atlas and are tax-deductible to the extent permitted by law.